The hype surrounding Take That’s new musical has sustained throughout its 17-month tour of the UK. 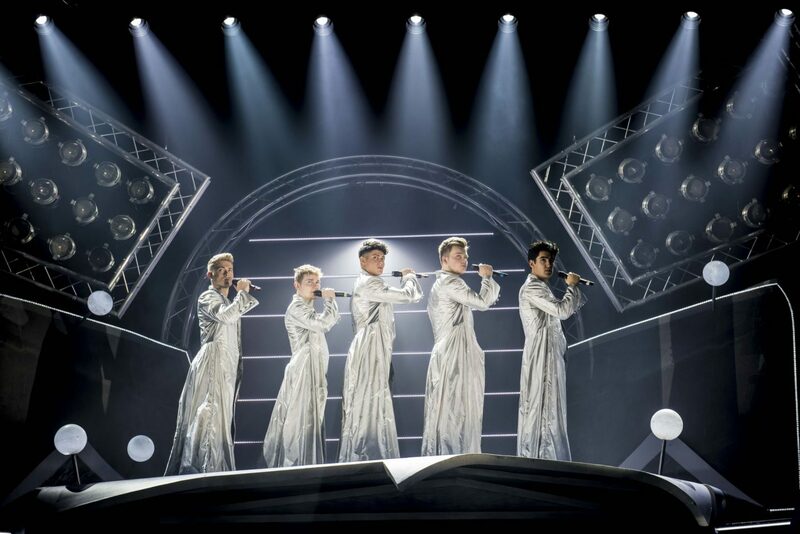 The show finally arrives at The Orchard Theatre, Dartford, this week – it’s certainly one for Take That fans to never forget and one general audiences will enjoy despite some niggling issues which could have made it shine. It’s 1993 and for five 16 year old girls, the band is everything. Join us as this group of girls who were once inseparable reunite after 25 years apart and try once more to fulfil their dream of meeting the boyband whose music became the soundtrack to their lives. Jukeboxes often suffer at the hands of unimaginative, threadbare plots with songs shoehorned around them, but one The Band’s best qualities is Tim Firth’s book. The story is one I’m sure many can relate to and is actually quite endearing, with humour by the bucketload. The Take That songs are woven in well but almost too well, and in act one the story of the five friends seemingly overshadows the Band. Act two feels more like your standard jukebox musical but sadly I want more from the soundtrack in general. A mixture of sound level issues and low vocal volume means a lot of the singing lacks power where it should be blowing the audience away. You don’t get this until The Flood in a gig setup which annoyingly lies three songs from the end of the show. It’s got all of your classic Take That tracks though, and the Band (comprising of BBC Let It Shine’s AJ, Nick, Curtis, Yazdan and Sario) bring them to life in sometimes hilarious ways. However the women are the stars of this piece. Rachel Lumberg (as Rachel) truly leads the show and you become part of her story. Both the women, and the younger versions of themselves, impress. The set design works really well, creating a fluid, well-oiled machine with its mixture of projection, moveable staircases and minimal set. This lends itself to the comic appearances of the Band from lockers and even statues. Die hard Take That fans seem to be loving this show. For me there was a little something missing musically, surely a travesty for a jukebox show, but when it redeems itself with a sound plot that’s actually quite charming you realise that you’re still kind of enjoying the band’s back catalogue and possibly even get up to dance at the end! The Band is pretty much sold out at The Orchard Theatre, Dartford, but continues its UK tour until May. Ticket information can be found here.